Learning to marble on fabric was the next logical step for me in my pursuit of a higher marbling education, so to speak. The truth is, after marbling steadily for the past two years (and marbling on and off for the past five), I could have taught myself how to do it. 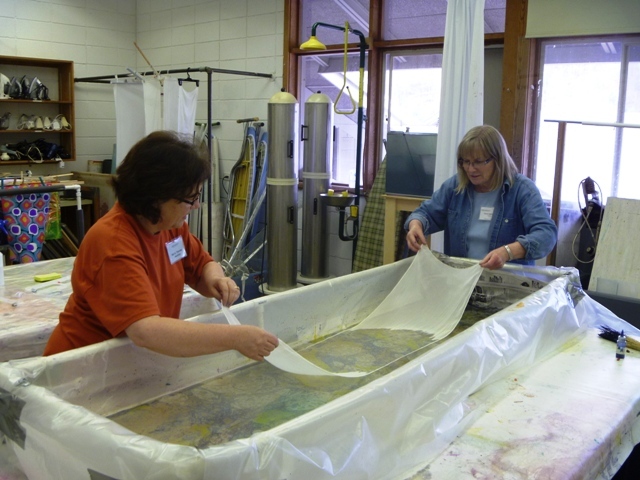 And if I hadn't been able to find a fabric marbling class or make it to one this year (which was on my 41 for 41 list), I would have done just that. But when Pat's Arrowmont class was finally given the thumbs up, I jumped on it. I really prefer learning in a hands-on classroom setting, feeding off other students' energy and having the immediate feedback of an experienced instructor, as opposed to being isolated in my studio and trying to make sense of written instructions. That's just the way I work. 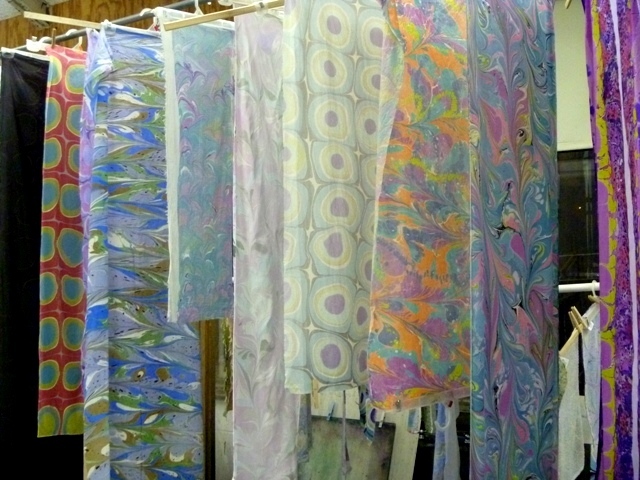 The biggest difference in marbling on fabric over paper is the prep and post work involved. With paper, you just alum, marble, rinse, and set out to dry...all in a span of 15 minutes. Done. Fabric, on the other hand, needs to be washed, dried, alumed, air dried, and then ironed before you even BEGIN marbling on it. Once it's marbled, the fabric needs to air dry again and sit for three or so days to cure and then you do an "aggressive rinse." Then air dry (again) and let the fabric rest (again) for another week before doing a final hand wash, air dry, and heat set with an iron (again, again, and again). Whew! It's exhausting just writing about it. I think I washed and ironed more this past weekend than I have in my entire life (which isn't really saying much since Emmett has done our laundry for the past 20 years. But still...). 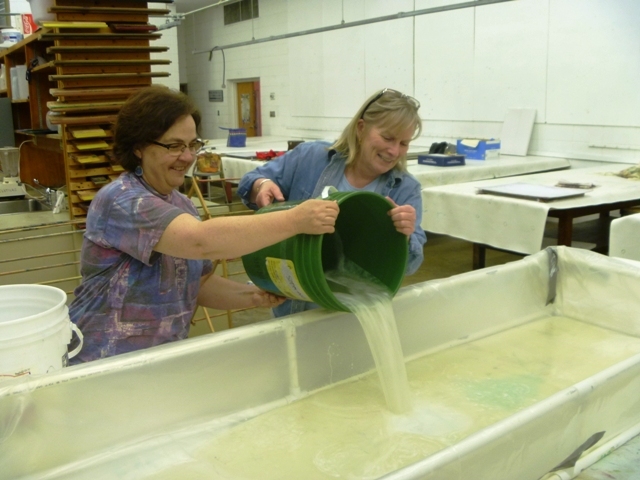 The second most notable difference in marbling on fabric versus paper is the size of the tank one uses. 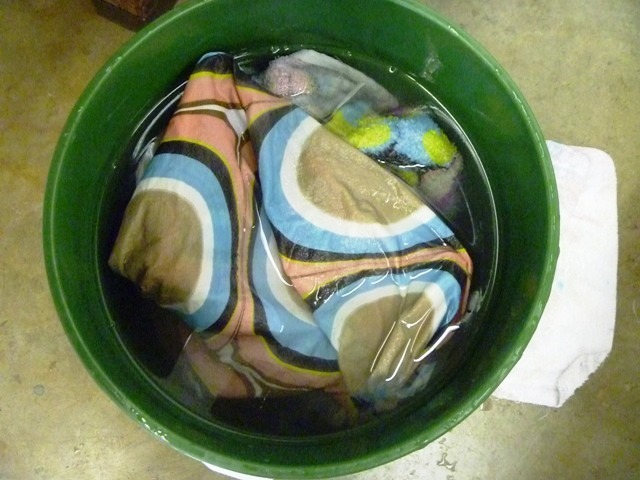 Now, one can easily marble fabric in any size tank. 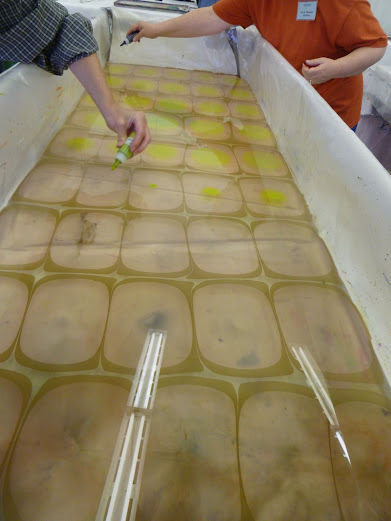 For half the class I marbled in a standard 18" x 20" tank. BUT...to marble things such as long scarves or large cuts of fabric, you need a bigger tank. Our class went all out and set up one that was 25" x 75," otherwise known as The Monster Tank. And a monster it was! Holy Intimidating, Batman! 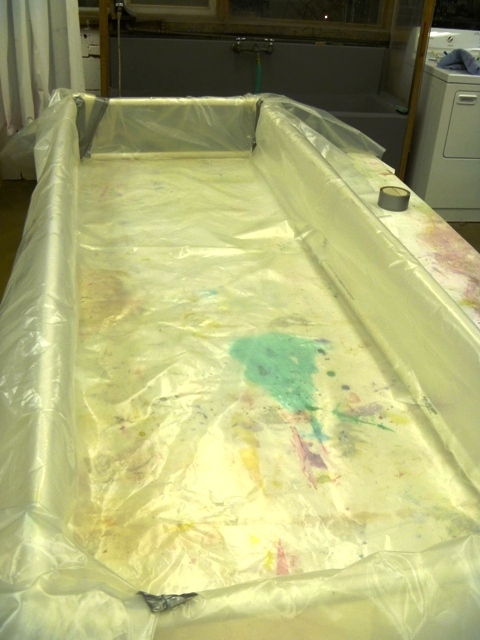 Staring down into The Monster Tank, all that open bath to be designed on, needing to rapidly lay down paint so a film doesn't develop on the surface and then laying down fabric before it all starts to break down...AAAAAHHHHH!!! Remember how you felt as a kid the first time you were standing at the end of the diving board that was 15-feet high above the community pool you had been swimming in all summer long? You had been diving off the low diving board for months, no problem. Back dives even! You love the water. You love jumping into the water. You love a thrill. But there you are, WAY up there on the "high dive," that water WAY down there, and your courage nowhere to be found. THAT'S how I felt when I first looked into The Monster Tank. And if I felt that way about the tank as an experienced marbler, I can only imagine what was going on in the minds of the my fellow classmates, all of whom were marbling NEWBIES!! But our wonderful teacher Pat soon gently coaxed us to The Monster Tank with sweet, encouraging words of support, calming our fears and assuaging our concerns ("I'm right here next to you. You'll be fine. I won't let go of your hand until you're ready."). And then, when we had swallowed our fears and were ready to make the jump, she went all Drill Sargeant on us (well, as Drill Sargent as one can be when you're smiling and excited to take your students to the next level): "What's your plan? You have to have a plan before you begin!" "Lay that paint down, NOW!" "Don't let that drip back into the tank...get it into the rinse bucket!" Her sense of urgency, of course, was more than completely justified...it was totally necessary. When it comes to The Monster Tank, there is no time to mess around. And quite honestly, without Pat's stern but guiding hand, I don't think any of us would have dared to try, let alone have survived, The Monster Tank. We certainly wouldn't have ended up with the magnificent pieces of fabric that we did. After our initial fears were beaten into submission by Pat ("there's no time to be afraid, we've got lots of fabric to marble"), there was no stopping us. Suddenly we were vying for Monster Tank time and Pat went from Drill Sargent to referee. 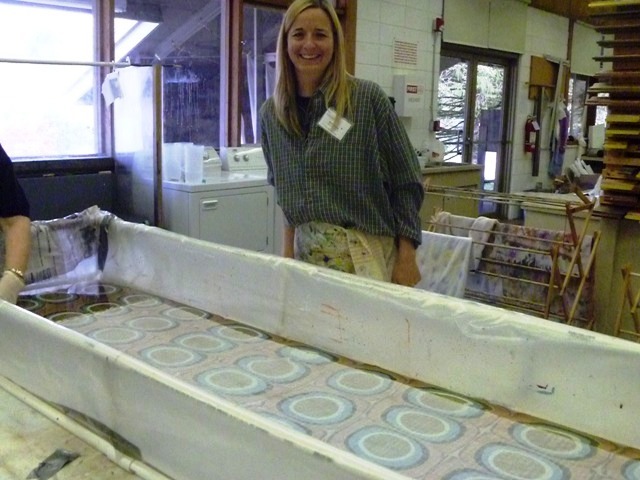 Despite the extra steps and the BIG, SCARY TANK, I fell in love with marbling on fabric. 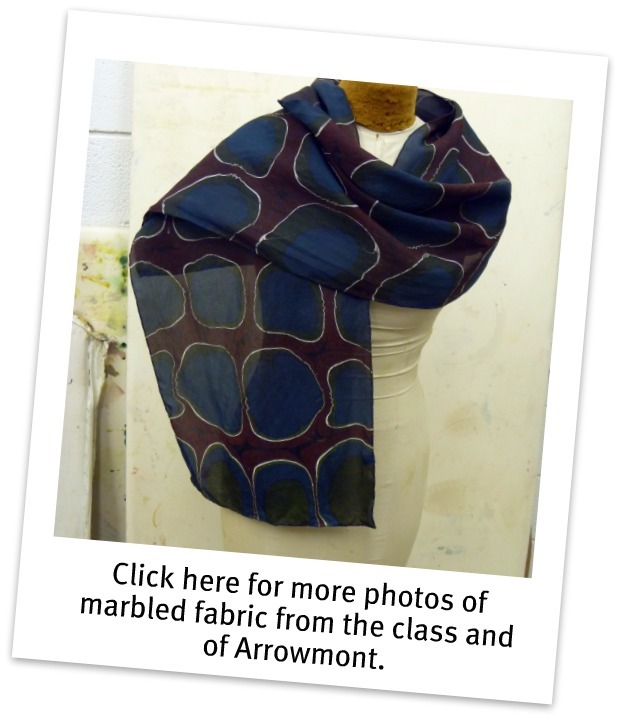 Like with paper, there are so many different kinds of fabric to marble on giving you a variety of effects. 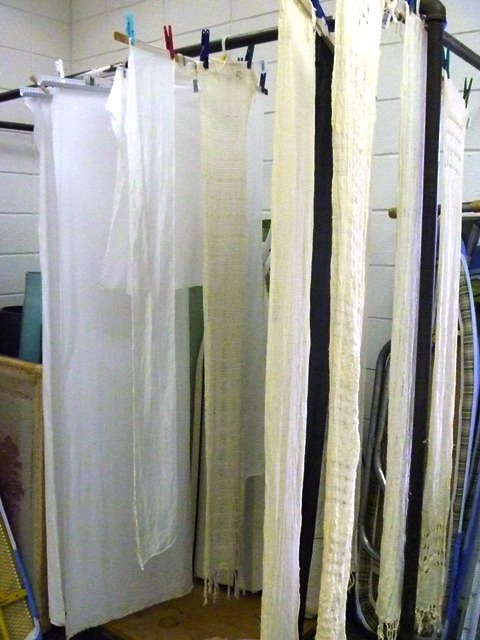 I was particularly enamored with the raw silk one of the participants brought in. 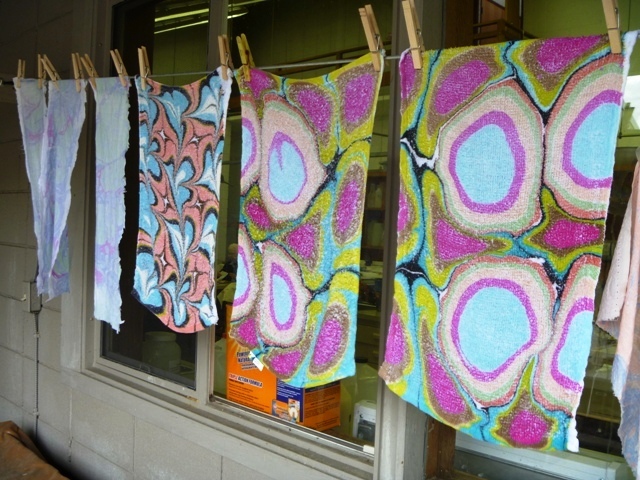 I also liked marbling on hemp canvas...which is the perfect material for making PLACEMATS!! As I mentioned earlier, I love being around other marblers and this was no exception. From Wanda's technical wizardry to Kathy's enthusiasm, from Shasha and Missy's deep love for bright, bold patterns to Laura's quiet but adventuresome experimentation with materials and Karen's go-for-it attitude, I couldn't have been surrounded by a better group of people. 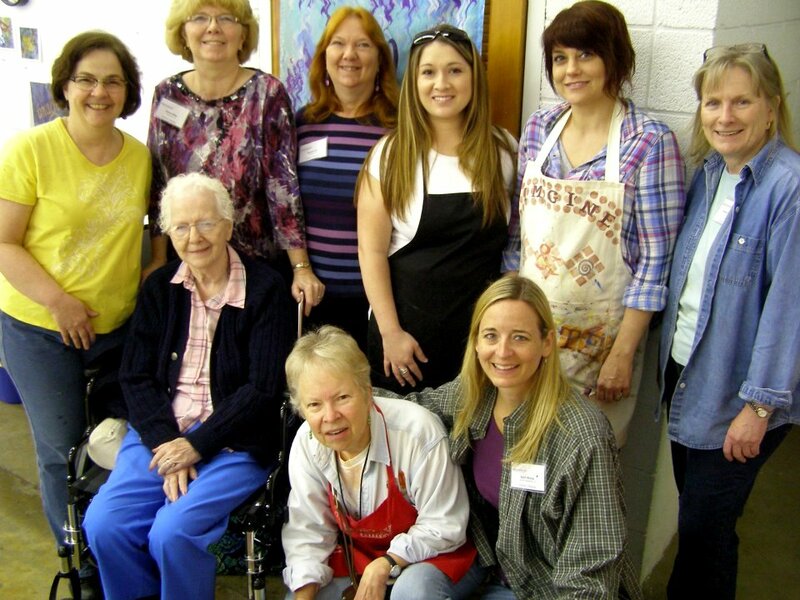 They reinforced my passion for the art and got me to break out of my marbling routine and try new things. 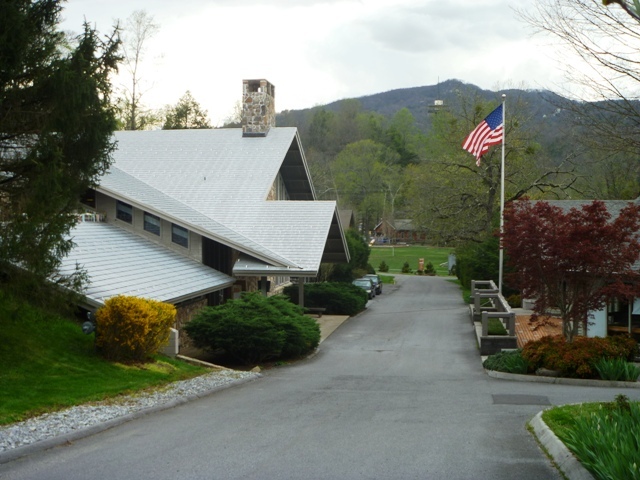 And all of this occurred on the lovely campus of the Arrowmont School of Arts and Crafts in Gatlinburg, Tenn. Arrowmont has some of the best, most well equipped and organized studios I have ever been in making it one of my favorite places to take a class. I couldn't recommend the place more. 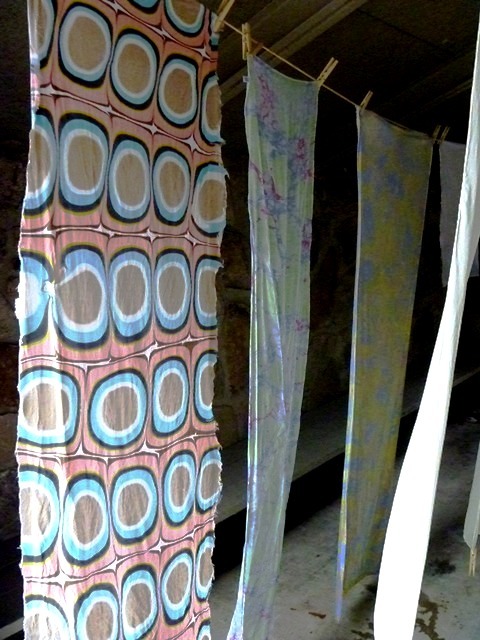 The marbled fabric pieces I made in class are home with me now. They have gone through their second rinsing and at this very moment are hanging to dry on clothesline I have strung inside my garage. I keep making excuses to go out there just so I can see them again and again--I'm THAT in love with them. I'm dying to put them to use too...scarves as gifts, fat quarters for quilting, large pieces for sun shades for my inside studio, smaller pieces for placemats and napkins! And, believe it or not, I can't wait to build my own Monster Tank. Once I do, you're more than welcome to come over and face the beast yourself--IF YOU DARE!